Niels Harrit has been Associate Professor at the Department of Chemistry, University of Copenhagen, for 37 years. This is a translation of a feature article printed in the Danish Newspaper, Information, on 31 March 2007 (requires subscription). Images have been added below to support the text. How, not why, did World War Three start? We are not talking about conspiracy theories, absolutely not. We are talking about elementary physics and chemical processes, Newton's laws, gravity, the melting point of steel, and the like. The World Trade Center was a complex made up of several buildings. The best-known, of course, were the two towers, WTC1 and WTC2. Together with five other smaller buildings – numbered 3, 4, 5 and 6 – they formed a perimeter around a central plaza. 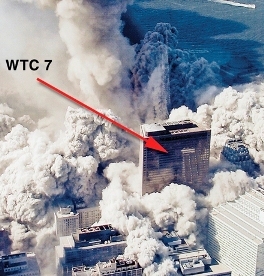 On the far side of building 6, over 100 metres from the North Tower (WTC1), was building seven (WTC7). It was a very large 47-storey office building. The two towers collapsed on 11 September 2001, after each was struck by an airplane. Everyone on the globe who had access to a television set has seen the dramatic and tragic images. However, to this day, only very few people are aware of the existence of WTC7 or its fate. This building was not hit by any airplane, but still collapsed seven hours after the towers. This feature article is about that event. WTC7 was built around a core of 24 massive steel columns, connected by an asymmetric pattern of steel cross beams. The building periphery was made up of 57 smaller columns. There was enough redundant capacity in the design to handle loads several times greater than foreseeable loads from hurricanes or earthquakes, etc. 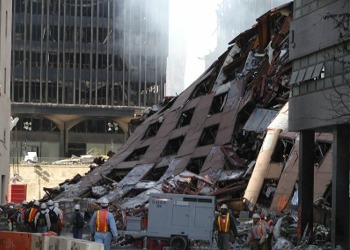 The collapse of the nearest tower, WTC1, caused damage to the lower floors in the southwest corner of WTC7. Building debris from the high tower and large amounts of dust poured in through the windows. Randomly distributed fires then broke out on other lower floors in the building. One of the other buildings in the complex, WTC5, was much more seriously damaged by the collapse of WTC1, but the rest of the structure remained standing. WTC7 did not. After the building had smouldered for seven hours, it collapsed, perfectly symmetrically. It was quite literally levelled, and ended up as a pile that was basically confined to its footprint. The process took 6.4 seconds, which is equivalent to "free fall". If you had stood on the 47th floor and thrown an apple out the window at the exact moment the collapse began, your apple would have hit the ground at the same time as the roof. In the hours following the airplane strikes on the two towers, a global myth began to spread that the World Trade Centre collapsed due to fire and mechanical damage. The only problem is that no steel structure has ever before collapsed due to fire, it is historically unprecedented. 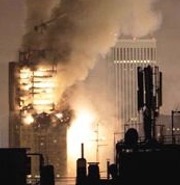 Over 400 cases of fire in that type of skyscraper are known prior to 2001, and none have collapsed. Not one. 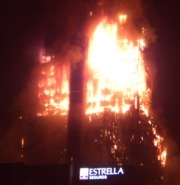 During a well-known tower fire in Madrid (2005), the whole building was engulfed in an inferno of flames for 24 hours. It remained standing. We classify combustion based on how much oxygen is being supplied. In a Bunsen burner or a welding torch, air and oxygen are mixed with the gas prior to entering the combustion zone. Rather high temperatures can be reached, as can be witnessed in a welding torch. But when something burns on its surface, preventing access to large quantities of oxygen, as in the case of normal surface fires, the temperature is typically limited to 500-650° C.
The fires in the WTC1 and WTC2 towers were oxygen-starved fires of this nature, as could be seen from the large quantities of black smoke. The jet fuel was burned up within a few minutes, and the temperature would never have exceeded 650° C. This is true no matter how much jet fuel there was. It is also difficult to achieve high local temperatures in a steel structure, because the heat is conducted away and spread throughout the whole structure. According to official computer simulations, no components of the towers reached temperatures above 600° C.
Steel melts at 1,500° C, but begins to soften at around 425° C. Half of the structural strength has been lost at 650° C, and the steel begins to glow red. But even if only half of the structural strength remains, the structure can easily bear two or three times the load. It is only at 800° C that the structure would being to break down. The fact that steel doesn't easily melt is something we should all be thankful for in our daily lives. Otherwise, your domestic oven would end up as a lump of cast iron, and frying sausages over a gas flame could also lead to unpleasant consequences. And if it was possible to bring down skyscrapers by setting fire to some office furniture, you could patent the method and set up a very profitable demolition business. There is therefore no scientific precedent that justifies pointing to commonplace fires as a possible explanation for the collapse of WTC7. Surely then, the explanation must be that the enormous weight of the debris from the collapse of towers WTC1 and WTC2 damaged the building or its foundations to such an extent that it collapsed? After a delay of seven hours? 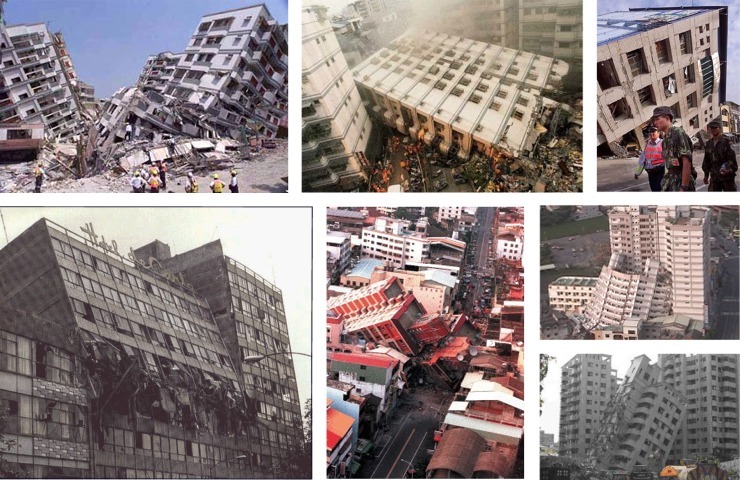 When tall buildings are exposed to extreme earthquakes, they tip over as they fall. If there is enough room, they sometimes tip right onto their sides. WTC7 collapsed exactly like a house of cards. If the fires or damage in one corner had played a decisive role, the building would have fallen in that direction. You don't have to be a woodcutter to grasp this. It therefore wasn't damage to the foundations that caused WTC7 to collapse. Two official explanations of the events in Manhattan on 11 September have been put forward by the Federal Emergency Management Agency (FEMA), and the National Institute for Standards and Technology (NIST). In the final FEMA report, WTC7 is hardly mentioned. 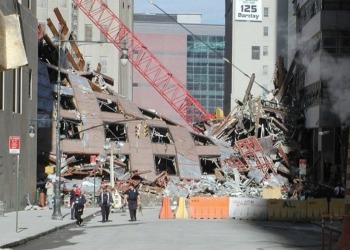 They note that there were fires in the building, but do not attempt to explain the collapse. The final NIST report was released in September 2005, but the section covering WTC7 was left out, with the promise that a final version would be released later. Publication has been delayed several times, and we are still waiting for it. In a draft summary of the WTC7 report from April 2005, NIST admits that they have only worked using the hypothesis that the collapse of WTC7 was a "normal" collapse. They try to make a case for this by presenting a diagram in which a bearing column is purportedly destroyed by the fires and the mechanical damage seven hours earlier. The vertical collapse of this column is supposed to have pulled the structure apart horizontally, after which the building collapsed in one synchronous movement. The NIST report simply presents this hypothetical sequence of events. The authors do not go to the trouble of actually claiming that this is what happened. In other words, we should picture a huge steel grid 47-storeys high, in which one of the vertical steel girders is torn asunder. It is difficult to reconcile this mental picture with the video recordings of the collapse available on the Internet. NIST actually took the sensible step of engaging a company to construct models of the steel structure in the two towers. The models were then exposed to fires and damage. Even though temperatures were used which were significantly higher than what could have resulted from the attack, they were unable to provoke a collapse. The models remained standing. NIST chose, however, to ignore this result. The attack on the World Trade Center was a tragedy for the people in the towers and in the airplanes, and a tragedy for their families. It also marked the beginning of the tragic war on terror. The current trends in Western society towards greater surveillance and the loss of civil rights can also only be called tragic. If we have also been lied to, the tragedy is complete. How did WTC7 collapse? We are not asking 'why'. This is no conspiracy theory. There is no burden of proof on us. Some extremely simple observations have been made, and we want to hear an official explanation that is consistent with elementary physics and chemistry, and common sense. If you want to investigate the conditions described above, you won't find anything in the media. But Google something like 'WTC7' and you will find a flood of information. There are tens of thousands of people who have a feeling something is wrong. But there is not a word about it in the media.